When 12 year old Cassius Marcellus Clay's bike was stolen from outside the gym in Louisville, Kentucky he reported the incident to a cop who was in the gym at the time and said: "I'm going to whup whoever stole my bike". The cop advised boxing lessons first. Clay took that cops advise and within weeks he was given his first bout, won... and that was the start of a legendary career in boxing. Six years later, in 1960, Cassius Clay was selected to represent his country at the Olympics in Italy. At 6 foot 3 inches tall he was an imposing figure, add the fact that he possessed a powerful jab, incredible speed and foot work like no boxer before him, he was a formidable fighter. He went on to win Gold, became a national hero and then turned professional. At the age of just twenty-two, Cassius Clay, who had won all his professional fights up until then, was given the opportunity to fight the the World Champion, Sonny Liston. Liston was the most intimidating boxer of his day, destroying Floyd Patterson in the first round on two occasions. Clay was a glib, fast talking, confident young man who enjoyed the spot light. He was good but after being knocked down by a left hook from British heavy-weight fighter, Henry Cooper, earlier that year, most people thought that it would be Liston's killer left hook that would end his hopes of becoming a World Champion. 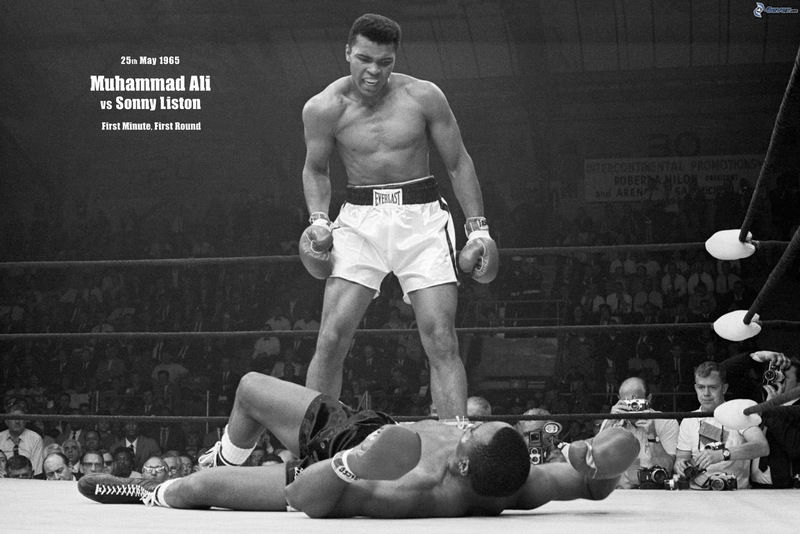 The fight started, Clay was very much the under-dog, and as most expected, Liston was leading the way. But by the third round it was obvious that Clay was starting to take control. By the fifth round Liston was displaying a cut and swollen eye that needed treatment and he was breathing heavily. When the bell rang to signify the end of the sixth it was obvious that Liston was in trouble. When the bell sounded for the start of the seventh Liston failed to come out of his corner and Cassius Clay was declared the winner by technical knockout. Clay moved into the center of the ring, raised his arms and danced the jig that would go on to be known as the "Ali Shuffle". He'd done it, shocked the world and become the youngest ever boxer to take the World Title from a reigning world heavy weight champion. A rematch was quickly set up but the fight ended just as quickly after only 1 minute and 52 seconds of the first round. During the Sixties Cassius Clay was unbeatable, winning every fight and many by Knockout. After joining the Nation of Islam in 1964, Cassius Clay changed his name first to Cassius X and then a week later became Muhammad Ali. Three years after becoming the world champion Ali was stripped of his title for refusing to be drafted into the Armed services - it was against his religion and beliefs. It was over four years later when he won his appeal and was able to fight again. Ali's return to the ring saw a triumphant win against Jerry Quarry with a knock down after 3 rounds. Next it was Oscar Bonavena. The fight was staged at Madison Square Gardens and Ali finally put Bonavena down in the 15th round. Winning this fight now made him the top contender to fight Joe Frazier, and in 1971 the fight was quickly organised and named "Fight of the Century". It was a tough fight, Ali was knocked down in the 15th round, finally losing on points. Ali may have been down but he was certainly not out. 1972 saw him win six fights including a second bout against Floyd Patterson. Things were looking good but then he suffered his second defeat at the hands of Ken Norton who knocked him down and broke his jaw. 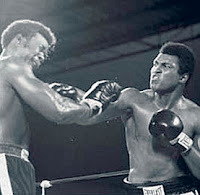 Muhammad Ali was carefully considering retirement but then he was offered a re-match against Ken Norton he won on points and this lead to another shot at Joe Frazier. The rematch was staged in 1974 and Ali was triumphant - winning on points. 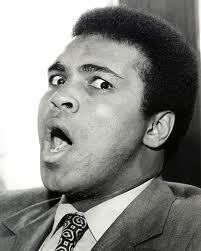 Now, Ali was once again top Contender for a shot at the World Heavy Title but the man to beat was George Foreman. No one really gave Ali a chance, Foreman seemed unstoppable and unlike Ali who'd lost to both Norton and Frazier, Foreman had beaten them, putting both them on the canvas in the 2nd round. On 30th October 1974 Muhammad Ali squared up to Foreman in a fight that would be remembered as the "Rumble in the Jungle". It was a epic battle that saw Ali dodge Foreman's punches, and then lean on the rope - a technique that became known as Rope-a-Dope - while Foreman threw everything he had in an attempt to knock Ali out. Ali blocked every punch, Foreman was tiring and in the 8th round Ali unloaded a flurry of punches and put Foreman on his back. Against the odds Muhammad Ali had pulled off one of the greatest upsets in sporting history and was once again World Heavy Weight Champion. Now Champion of the World, Ali was riding high. His next fights were against Chuck Wepner, Ron Lyle and Joe Bugner... he won every fight—Wepner knocked Ali down in the 9th round but Ali claimed he'd simply tripped over Wepner's foot. Ali then agreed to a third bout against Joe Frazier. Fighting in temperatures in excess of 100°F it was a long and brutal battle that would become known as "The Thriller in Manila". Ali once again used the "Rope -a-dope method, leaning against the ropes and absorbing immense punishment as Frazier unloaded everything he had. At the end the 14th round both me were exhausted but Frazier with a badly swollen eye and in no condition to carry on threw in the towel. Ali was still the champion. After the fight Ali cited Frazier as "The greatest boxer of all times, next to me". Ali continued his reign as champion but was noticeably slower, he kept winning but the decisions we far closer, some controversial. In 1978 Ali faced Leon Spinks, a much younger, leaner boxer. The fight went the distance and Ali lost to a unanimous points decision; Leon Spinks was crowned champion. Most people thought Ali would retire, some even told him too, but he refused and eight-month later he was granted a re-match against Spinks. Then the unthinkable happened - Ali won and became the first ever boxer to win the World Title three times. On the 27th July 1979 Muhammad Ali announced his retirement, it was, however, short lived. Ali came out of retirement and lined up to fight WBA world champion, Larry Holmes in an attempt to win an unprecedented fourth title. Despite Ali suffering from stuttering vocals and shaking hands (it was the onset of Parkinson's) he got the all-clear to fight. Ali lost, Holmes by far the superior boxer. Ali was tired and breathless and in round eleven Angelo Dundee, his trainer, threw in the towel. 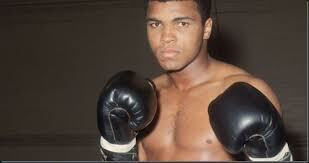 There were many calls for Ali to retire but despite all pleas Ali still fought one more time. His last fight was against Trever Berbick in the Bahamas and, as expected, he lost on a ten round decision. He announced his retirement shortly after this and never fought again. In 1984 Ali was diagnosed with Parkinson's Disease but despite this still remained active, appearing on TV, receiving sports awards and raising over $46 million dollars for the Muhammad Ali Parkinson's Center in Atlanta. He starred in several motion pictures including "Freedom Road" playing Ex-slave Gideon Jackson in 1870's Virginia. "The Greatest" was an adaptation of his own biography, were he played himself. He made appearances in many of the top Television shows of the day including: "Different Strokes" and "Touched by an Angel". He recorded an album titled "I am the Greatest" and even appeared in a short lived Broadway musical, too. In 1996 Ali was the man who lit the flame at the Atlanta Georgia Olympic Games. 1998 saw him named named Sportsman of the century by Sports Illustrated and BBC Sports Personality of the Century, and he was honored with a star on the "Hollywood Walk of Fame". Even though ravaged by the effects of Parkinson's it didn't stop him being the Flag Bearer for the Summer Olympics in London in 2012 but due to effects of Parkinson's he was unable to raise the flag and instead stood in front of it. Muhammad Ali became one of the most recognizable figures on the face of the planet. Over forty years after he burst on to the boxing scene he is still known and loved by millions. No boxer or sportsman has become so important to popular culture as Muhammad Ali. He wasn't just a boxer with incredible skill, fast reflexes and lightening foot-work who avenged his three main defeats form Frazier, Norton and Spinks just as a true champion should, but he was also a philanthropist, a human rights activist, a champion, an entertainer, and a leader. His life inside and outside of the ring makes him... "The Greatest".